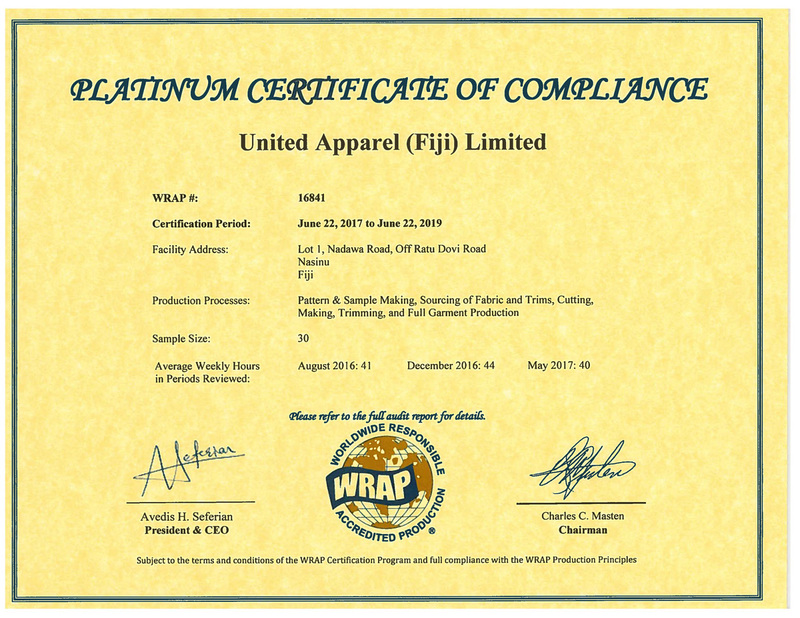 United Apparel is also a Worldwide Responsible Accredited Production (WRAP) facility. WRAP is the world’s largest independent certification program mainly focused on the apparel, footwear and sewn product sectors. Becoming a WRAP certified facility involves much more than simply passing an audit. WRAP takes a collaborative approach to social compliance certification in which it works with the facilities to ensure they remain within WRAP’s 12 principles. This requires certified facilities to actively engage in the process themselves, ensuring that effective management systems are maintained to ascertain that compliance requirements are met. Indeed it was a proud moment where much time and effort contributed by our team led to attaining this certification. A further celebrated success was the factory receiving a GOLD status certification during our first audit attempt. And a Platinum certification on our next attempt. This is an excellent testament of our high level of commitment to the principles of WRAP that we strongly and unrelentlessly adhere to. This significant achievement allows us to be connected with other global WRAP certified factories that promote social compliance and safe, lawful, humane ethical manufacturing. It also indicates to our clients that United Apparel has the competitive edge, a factory committed to sustainability and accountability.